Badam payasam or badam kheer is a delicious, creamy Indian style almond pudding made using almonds, milk, sugar, cardamom and saffron. Here we also use sweetened condensed milk to make this badam payasam even more creamy and delicious. Badam kheer is protein rich and calorie dense as we use almonds to make this delicious, delectable dessert. Almond kheer or badam kheer, as known as badam payasam in South India is a classic Indian dessert which can be served after dinners, and you can make it part of any party meal menu, potluck etc as this is so delicious and makes a special treat for everyone. 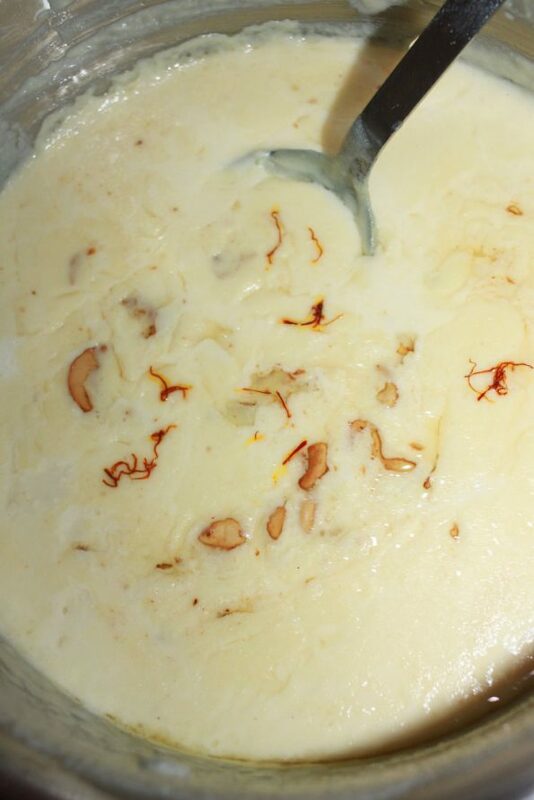 Badam kheer is also very filling and easy to prepare too if you have soaked almonds in advance to make this dessert. 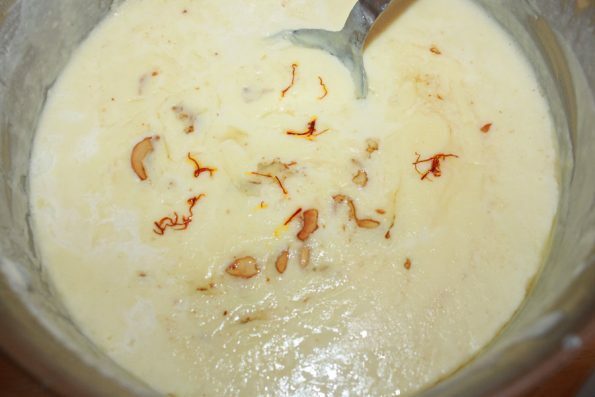 This badam payasam or kheer is also a very rich, royal and delicious Indian dessert which is very kid friendly as well (provided there is no nut allergy) and its also often prepared during festival times in India. 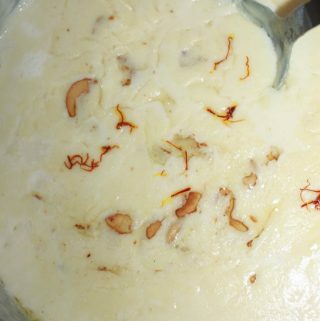 To make the perfect badam kheer, make sure to use cardamom and saffron as they are very necessary for the flavors and also make sure to follow every instruction in the recipe, as it can be little tricky to get the perfect flavor and texture, though the instructions are easy to follow and this dessert is simple and easy to make. So here is how you can make easy, delicious badam payasam following this badam kheer recipe with sweetened condensed milk. Badam payasam or badam kheer is a very rich, delicious and royal Indian dessert made using blanched almonds, milk sugar etc. We use condensed milk in this badam kheer or almond kheer recipe to make this more rich and more delicious. Soak the almonds in enough water overnight or at least 4 to 5 hours so the almonds will soften up. Discard the water used for soaking the almonds, wash the almonds in fresh water. Heat water in a pan and when the water is hot, add the almonds. Let the almonds sit in the hot water for about 10 minutes. After 10 minutes of being in hot water, take each almond and remove the skin of the almond, the skin of the almonds will easily come off at this stage. Transfer the blanched almonds to a bowl, keep it aside. In a pan, heat 1 cup of milk and when the milk is hot, switch off the stove and add the cardamom pods and saffron strands. Let this sit for about 10 minutes so the saffron will dissolve in the milk giving it a light yellow color and also the cardamom pods will soften up. After 10 minutes, transfer the milk with cardamom and saffron to a blender and blend very smooth. Filter this mixture through a fine mesh strainer to remove any coarse particles from the cardamom. Transfer the saffron milk back to the blender and also add the almonds and grind this mixture until very smooth and creamy. I added the remaining 3 cups of milk (along with the one cup of saffron milk) and did the grinding in two batches, which helped me to grind the almonds very finely. Its important that you blend this almond mixture to a very smooth and creamy mixture without any coarse particles, as that won't taste good in the kheer. So, make sure to grind the almond milk mixture very smooth and creamy. Now heat one tablespoon of ghee in large pan and transfer the almond milk mixture to the pan. Cook the almond mixture in medium to low heat for about 5 to 6 minutes while you keep stirring the mixture. It is important to keep stirring, otherwise the mixture may stick to the bottom of the pan. Once the mixture is cooked, add the sweetened condensed milk and mix well, cook this mixture again for another 3 to 4 minutes in low heat while you keep stirring. Add the sugar, mix well and cook for another 2 more minutes all while you keep stirring the contents. If the kheer is more thick for your preference, you may add little more milk and mix well with the kheer. 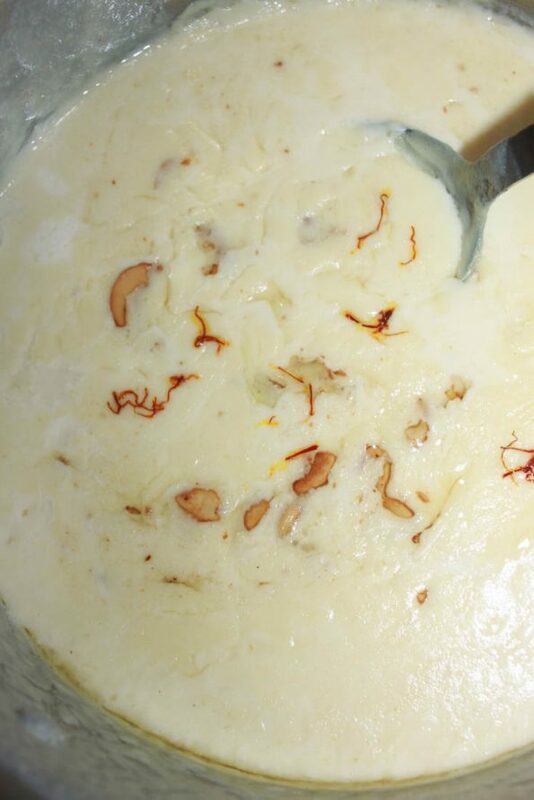 Now the delicious badam payasam or badam kheer with condensed milk is cooked and ready, let us prepare the garnishing (the kheer will slightly thicken as it cools down, so you may add little milk as needed based on your preferred consistency for the kheer). Heat one tablespoon of ghee in a small pan. Add the chopped nuts and light fry. Add the raisins and let them pop. Pour the ghee with nuts and raisins on top of the kheer and gently mix in (if you are serving for small kids, you may leave out the nuts as the nuts will be difficult to spot in the badam kheer unlike the vermicelli kheer or rice kheer where they mostly stay on top of the kheer). Add the safffron strands too on top of the payasam (kheer). Serve the delicious badam payasam hot or warm or you can refrigerate the payasam (once its cooled enough) for about 2 hours and serve chilled for best results, as this payasam tastes the best when serve chilled. The badam kheer won't absorb too much milk like vermicelli or rice kheer as it cools down, but will thicken slightly so you can add little more milk as needed to adjust the consistency of the kheer based on your preference. Make sure not to skip the cardamom or saffron for this kheer, as they are very important for the flavor of badam kheer. You may also use about 1 teaspoon of cardamom powder instead of cardamom pods if you do not have cardamom pods. But I prefer using the cardamom pods itself, as they also add a light color to the kheer as we blend the cardamom pods in the blender. If you are preparing this kheer for very small kids, you may skip the nuts. Hope you found this post on badam kheer recipe with sweetened condensed milk helpful in making really creamy and delicious badam kheer or almond kheer.